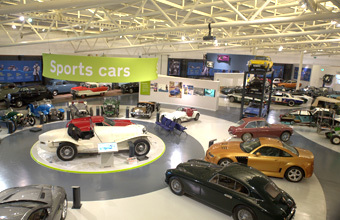 New look British Motor Museum is now open! The new look British Motor Museum opened its doors to the public on Saturday 13 February following a £1.1m refurbishment. Previously known as the Heritage Motor Centre, the Museum is now a modern and immersive display of British motoring history. The Rt. Hon. Gavin Williamson, MP, unveiled the new look Museum on Friday 12 February at a private preview event. It was then officially opened to the public at 10am on Saturday 13 February, by Managing Director, Julie Tew and Josh Harden, aged 8, the face of the Museum's marketing collateral. Local radio station Touch FM was also broadcasting live on the day. Visitors to the Museum are now welcomed via a new entrance to an introductory gallery which sets the scene and flows into distinctive new themed zones, including ones for Design & Concepts, Jaguar, Land Rover, Royal Cars, Motor Sport, and Film & TV cars. The popular ethos of allowing visitors to get up close to the exhibits has not changed but there are now different ways to view the cars. Many are on raised plinths including a series of Land Rovers on an all-terrain 'mountain' and some life-size matchbox style cars. The visitor experience is more interactive and immersive, visitors can now stroll along the Time Road, whilst touch screens provide interactive interpretation telling the cars' stories in more detail. Gavin Williamson MP, stated "I feel very privileged to unveil the new look British Motor Museum. I have loved classic cars since my father took me to the British Motor Show as a child. I am therefore delighted to be here today amongst 400 of the finest historic British cars to declare the Museum and its Collections Centre open for business. The British Motor Museum is instrumental in enabling visitors to learn more about the past, present and future of the British motor industry, its technology and its people. With the exciting improvements and enhancements now made, the Museum can now be counted as being amongst the best motor museums in the world". The new Collections Centre also opened on the 13 February, allowing public access for the first time to an additional 250 cars from the reserve collections of the British Motor Industry Heritage Trust and the Jaguar Heritage Trust. Tours of both the Museum and the Collections Centre will be available daily and can be booked at no extra charge on arrival, (subject to availability) and all half term family activities are also included in admission: Adults £14, Children £9 (5-16 years) under 5's free, Concessions £12 & Family £39 (2 adults & up to 3 children). Buy one day and get 12 months free if you Gift Aid your entrance. From 13 - 21 February, the British Motor Museum is celebrating half term with "Build a British Car Week". Every day children of all ages can test their knowledge with the 'Family Story' trail and join one of the workshops in the LEGO® Education Innovation Studio where they can get creative building British cars with LEGO® bricks.